Legal language, or ‘legalese’ as it is sometimes called, is a language that many people find hard to understand. This is because some of the words and phrases that lawyers and other legal experts use do not form part of regular everyday communication. However, when these experts speak and write using unfamiliar language it is often because they have to: ‘ordinary’ language cannot properly or accurately describe the often complex concepts and issues involved. This dictionary bridges the gap between the world of everyday language and the world of legal language. Users can access over 20 000 legal words, each of which is explained in plain English for the benefit of people without a legal background, as well as legal practitioners, law students and other members of the legal profession. 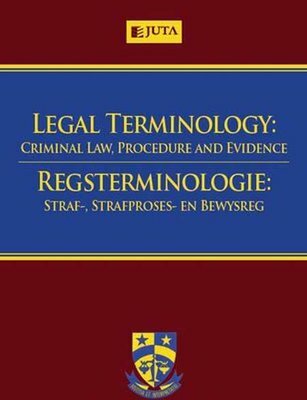 The dictionary deals with the areas of criminal law, criminal procedural law and law of evidence, and is aimed at familiarising users with the use of legal language in a number of settings, including the courtroom. A bilingual publication, this English–Afrikaans / Afrikaans–English dictionary also contains a useful list of Latin terms and phrases, together with explanatory notes, as a centre insert. Synonyms, homonyms and polysemes are identified and explained, and the dictionary provides guidance on the use of abbreviations and how to cross-reference lemmas (headwords).